My husband and I just recently celebrated our 5 year wedding anniversary. (That's half a decade...YAY!). As tradition has it, we get a babysitter for the children and head out for a date night that is just for the two of us. We usually visit a local restaurant, then go meander around a shopping mall. I always look forward to this special time that Greg and I get to be alone and enjoy each other's company without having to worry about what the children are up to and what sort of messes they are making. This year, we wanted to try something a bit different. We were tired of the same restaurants and foods and wanted something that we had never had before. So, the day we planned to go out I hopped on the Internet and began searching. I didn't know exactly for what I was looking, but knew I would know when I found it! So, I happened to find a restaurant called Bugaboo Creek Steak House. "What a great name!! This one has to be good!" I thought as I clicked on the link. Well, nothing could have prepared me for the amazing website I found. The graphics are AWESOME!! I actually had a really fun time clicking on the different icons and watching what would happen. LOL. So, after looking at the menu (which consisted of gluten-free foods, steak, chicken, fish, soups, salads and incredible looking appetizers) I told my husband that this was the place we were going to try. It was an hour and 20 minutes away, but that didn't matter. We were definitely excited! When we pulled into the parking lot, it was full and immediately I thought that we would have a wait ahead of us. The hostess opened the front door for us with a cheerful "Welcome To The Lodge!" and we stepped in. There was NO ONE waiting at all and we were seated immediately. Wow...I definitely wasn't used to this! 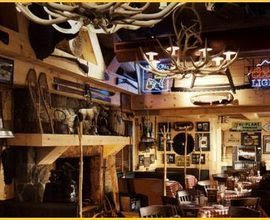 The inside of Bugaboo Creek Steakhouse is designed to look like a hunting lodge...complete with antler chandeliers, a huge fireplace and rustic tables. Our waitress was named Patti Sue and she was charming. She was prompt and took our order immediately. She also told us to feel free to walk around and look at the restaurant, it's pictures and meet the talking buffalo...who was mounted above the dining area. He was pretty funny as he would start talking at random times. We got right down to business and ordered our appetizers. We chose two appetizers, (they all sounded so good!) the Bunyan Onion and the BBQ Chicken Nachos. Our appetizers came out promptly and we were SHOCKED at how big the servings were. It wasn't a measly little plate but rather enough food to feed us and two other people. 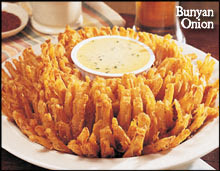 The Bunyan Onion was delicious and melted in our mouths (the dipping sauce added a nice "zing" as well). The BBQ Chicken Nachos were AMAZING...it was BBQ'd chicken over tri-colored nacho chips with cheese, jalapenos, diced tomatoes, salsa and sour cream. Wow...my husband really loved those! By the time our entrees came out, we were filling up quickly. Once again, we were shocked at the size of our portions. I ordered the Smokehouse BBQ Chicken and Greg ordered the Snowbird Chicken Platter. We both could not believe how amazing the Smashed Potatoes were...I mean real, creamy mashed potatoes with chives and seasonings. I can still taste them. One quick detail that I need to add here...I had ordered Loaded Smashed Potatoes and when a server brought my plate to the table, our waitress was right there by his side. She took one look at my plate and said "You ordered Loaded Smashed Potatoes, right?" I said yes, not knowing that what was on my plate was not the Loaded but original. She kept apologizing and insisting that she go and get me some from the kitchen. I assured her that I was fine and that these would be just fine. It was great to have her care so much about the error and want to make it right. By the time our stomachs were full, we BOTH had so much food left on our plates that we needed take-out boxes. Phew...that was alot of food! 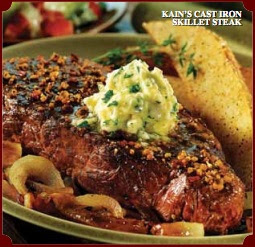 My husband and I were greatly impressed with the service, atmosphere and food of Bugaboo Creek Steakhouse. We are definitely going to visit again and want to take our friends and family there as well. Currently, there are 12 locations in the North Eastern part of the country. I sincerely hope they branch out to other states as well because you all would LOVE it there!!! If you are ever up this way, check them out...you will NOT be disappointed with your experience!!! Looks like a yummy place to go and maybe take your in laws for a meal, ha.